Winter is almost here in Hawley and we could not be more excited. The weather turns cold and snow begins to fall, it is a truly magical time of year. The residents and visitors of Hawley love spending their free time outside since there are so many things to do. One of our favorite things to do is go skiing. We have some of the best Pennsylvania ski resorts in the area. Our team at Ledges Hotel thought of our favorite ones to choose from and came up with Elk Mountain and Ski Big Bear. These two Pennsylvania ski resorts embody exceptional service with fun trails. Want to learn more? Here is everything you need to know to have the best ski trip at these two Pennsylvania ski resorts. The first ski resort we love is Elk Mountain in nearby Union Dale, PA. Before you come, check out their awesome webcam to get a live feed of what’s happening on the mountain. When coming to Elk Mountain, they have a variety of options for lift tickets and rentals. The slopes are open for an extended fun day of 8:30am-10pm and Elk Mountain is open weekdays as well as weekends and holidays. The lift ticket prices are broken into times of day as well as day of the week and age categories so be sure to check out their website for full pricing information. Consider yourself a beginner? They have a lift that goes to only the beginner slopes too. Just like lift tickets, you will need to secure rental equipment when you visit these Pennsylvania ski resorts. Elk Mountain’s ski rental prices are broken down by age category and time of week while there is just a flat time of day breakdown for snowboard rentals. If you plan on being at Elk Mountain a lot this winter, be sure to check out their season pass prices. Never set foot on a ski slope before? Consider yourself in safe hands when you sign up for one of Elk Mountain’s classes. If you are considering bringing your kids, Elk Mountain has excellent kids programs that start as early as 3 years old. Also, if you are thinking of bringing a group of friends, check out their fantastic group rates. 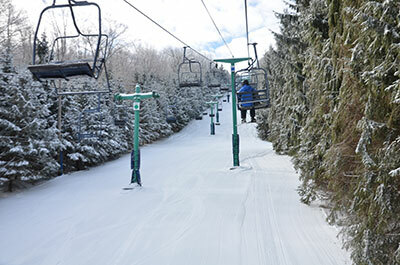 As you can see, Elk Mountain is an excellent choice when it comes to Pennsylvania ski resorts. If you are looking at a ski resort that is slightly closer to Hawley, then Ski Big Bear is a great choice. Not only do they have skiing but they have other fun winter activities to do on Masthead Mountain, like tubing which is great option for those who aren’t great on skis but love having fun on the mountain. They also have gift certificates available so you can also give the fun of Ski Big Bear to others. Ski Big Bear is open for most of the day, usually from 9am-4:30pm but be sure to check their site for specific times for your trip. Be sure to check out their site for lift tickets prices and equipment prices. They also have an excellent season pass program and multiple options for ski lessons for all ages. It’s easy to see why so many people choose Pennsylvania ski resorts when thinking about planning a fun ski trip. When visitors come to either of these Pennsylvania ski resorts, they love staying with us at Ledges Hotel in Hawley. Our hotel allows our visitors the ability to continue enjoying the sight and sounds of nature with our beautiful decks and views of the gorge. We also have different sized rooms for any group size. All the way from our Contemporary 1 room which features a Queen sized bed and is perfect for the lone traveller or couple who just need a place to rest up to our 2 bedroom suites for groups or sets of couples who enjoy being together but also have enough privacy. Contact our fantastic staff today to book a room with us when you plan a trip to one of these fun Pennsylvania ski resorts. Christmas in Pennsylvania is Excellent — What’s Happening at The Cooperage Project in Honesdale, NY?